Between 2nd and 26th May 2008, Slovak expedition – SVALBARD 2008 will be operating on the Spitsbergen Island. 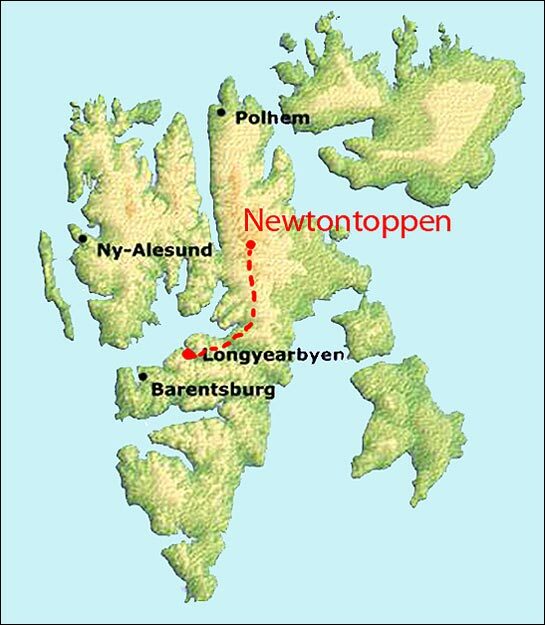 The aim of the expedition is to traverse the inland of Spitsbergen Island from the settlement Longyearbyen to the feet of the range of Atomfjella Mountains, to climb up on the highest peak of Svalbard – Newtontoppen on skis and take a nice ride down. We also plan to do winter mixed climbs. 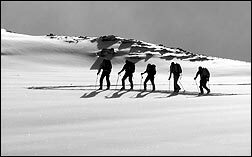 Nowadays expeditions are focused on traversing with light skis without ambitions to mount and ski down the peaks. Climbing expedtions usually use snowmobiles to approach the mountains or get further into the inland. Svalbard 2008 expedition combines ski mountaineering traverses, ski mountaineering descents and wintermixed ascents, without technical support, snowmobiles or additional food supplies. This free moving and natural approach makes this expedition unique. We'll carry all we pack. Through the Svalbard inland from Longyearbyen to the mountains of Atomfjella with total distance of 250 km. There is a risk of falling into glacier crevasses or being attacked by a polar bear. Climbing up and skiing on Newtontoppen peak, and other peaks that have never been descended on skis yet. Winter mixed climbs in the Atomfjella mountains range. Collecting samples of snow for analysis of heavy metal content, carried out by the Research Institute of Mountain Biology in Tatranska Javorina. To point out that the aims could be reached in harmony with the fragile environment of the Arctic region using no other means of transport but hiking and skitouring. This approach is crucially important in Svalbard, where the population of the polar bear is endangered by global climate change. In cooperation with www.MADMARMOT.eu studio, documentary will be created. Photographic exhibition and presentation will be realized. After the successful accomplishment of the expedition, lectures on the environmental changes in the Arctic region and ski-mountaineering will be given at the elementary and secondary schools. Here u can download expedition leaflet!